I'm so tired as I start to write this, but in a good way. It's late Sunday night, and we've had a busy but fulfilling weekend. Saturday we began the day as we have so many recently, at the ballpark. Nathaniel's last regular-season game was Saturday morning, and his team (which had been 1 and 11) finished the season 1 and 12. But the last game was such fun to watch! I think we scored more runs than any other game all season, so even though the other team won in the end, it was a close game and well-fought by our Braves. It was marred only by the fact that Jakey had a complete blowout midway through the game, all down his legs and partially on me. PLEASANT. After the game was over, Grayson headed to Target to get provisions for the T-ball party later that evening, and I let the boys play on the playground at the ballpark, as I'd promised. We played for about an hour (Jakey, pantsless), and then on the walk back to the van, they got engrossed in one of the 13-year-old games being played. I decided we could spare a little more time before getting Jakey home for his nap, and they were so cute sitting on the brick wall, watching the big kids play ball. Around the 3:00 mark, I had to drag them away so we could get home for Jake to get some semblance of a nap before our T-ball team started arriving for the party, and luckily he slept until about 10 minutes before the first family pulled up. The kids hadn't been at our house for five minutes before the weapons started getting pulled out. EVERYONE ended up with a light saber or a sword. We had 13 kids, and some of them had more than one weapon ... it was a loud, pretend-violent party. Some of the boys ate on the porch or at the table with us, but most of the teammates opted to eat in the yard ... closer to the weaponry, you know. 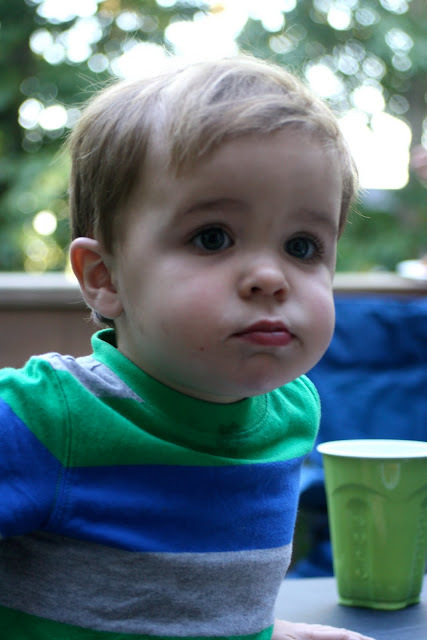 Jakey sat with me and our coach's wife, Daphne, and their 1-year-old son Braxton at a table on the deck. Jakey really enjoyed his hotdog and fruit salad. His mouth stayed full for about 30 minutes. As soon as we were done eating, a pickup game of -- what else? -- baseball commenced in the backyard. We have some rubber bases, and we pulled them out and set up a loose diamond. 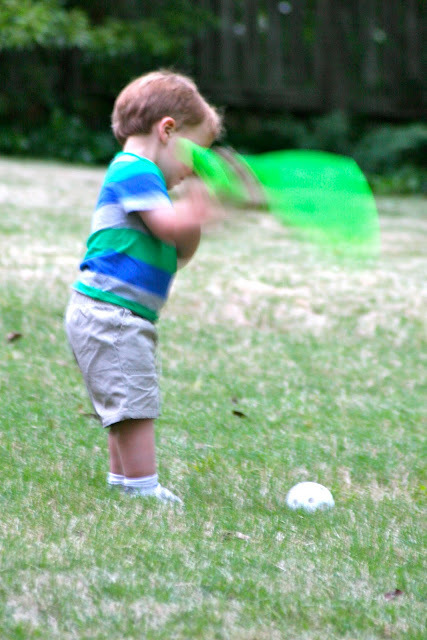 Jake pitched an absolute FIT because he couldn't play with the bigger boys -- we would have let him, but all he wanted to do was grab the bat and run away with it, so we got his own bat out of the garage and hoped it would distract him sufficiently. It kind of worked. When he wasn't busy batting his whiffle ball around in the grass, he was on the trampoline with some of the big boys. He will not be deterred from playing whatever the kids four times his age are playing, no siree he will NOT. And yes, it is entirely possible that light sabers and trampolines are a bad combination, but you wouldn't know it from this party. As darkness started to fall, we gathered the boys together for Coach Mickey to tell them how much he enjoyed coaching them. I think they broke away a total of three times and we had to re-gather them ... they fed off of each others' energy (and not always in a good way!) all night long. I think I mentioned one day last week that my flash is broken, courtesy of a run-in with some applejuice at the ballpark, so the darker it got outside, the blurrier my pictures got. 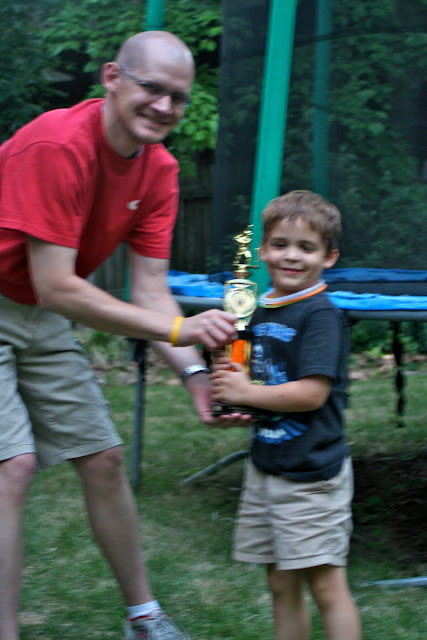 Too bad this picture of Nick receiving his trophy from Mickey was at the end of the night! No one left before well after dark, and it was so much fun entertaining such a large, fun group. Sunday morning Grayson and the boys let me sleep in EXTRA late, and when Nathaniel came to get me up, he asked me to come downstairs with my eyes closed. He led me to the kitchen table and then told me to open my eyes ... to this! The table was covered in cards and mementos of all kinds, all created by the boys for me for Mother's Day. It was so sweet. After lunch, Grayson took Nathaniel and Nick hiking in The Preserve while Jake took his nap, so I had three hours of P&Q (peace and quiet), which was a wonderful, rare gift. I'd thought I'd use it to scrapbook or nap, but you know what I did? I sat on the couch and watched The Big Bang Theory, Grey's Anatomy, 9 by Design and Top Chef Masters. I was a total slug AND IT WAS AWESOME. When they got home and Jakey woke up, we cooked out again (because this time of year it's multiple times a week). While the grill was heating up, Grayson started playing a game on Nathaniel's PSP in the playroom, and Jakey climbed up beside him in the recliner to play a game of his own. I happened to catch this glance that Jakey shot at Grayson while they were playing side-by-side, and I'm so glad I did. I think it's my favorite picture I've ever taken of the two of them. So sweet, all that adoration in his eyes. Then it was back down to business. We did bathtime early, and then Jakey and I went out to the deck to blow bubbles. Well, I say "blow bubbles," but that really just means that he dips the stick in a hundred times and never blows a single bubble, but shrieks at me in displeasure if I so much as OFFER to blow bubbles FOR him, and more bubble solution ends up on the deck and his shirt than anywhere helpful. Which is why we have one of those two-gallon bubble refill things, so that we can refill the bottles when he wastes more than half of them. He loved dipping the stick in the bottle, then sticking the stick down into the waffle weave of the table. He remained completely intent on his task, regardless of the fact that it seemed to serve absolutely no purpose at all, to me. Instead of going all Type A on him, I decided to just let him do his thang, and I just enjoyed the beautiful weather, his happy little coos and the knowledge that bubbles only cost like 25 cents. And it was perfectly LOVELY. He had a great time, and I loved watching him. It was such a nice way to end the weekend, quietly on the back porch, soaking it all in. I know I keep going back to how blessed I feel, but I really, truly do. I feel ready to meet the week, having enjoyed such a sweet weekend with my family. Yea for rejuvenation! Happy mother's day! I called you but didn't get you--hopefully you were napping or watching tv shows. You deserve it, you work so hard, and your kids are so great. I love you! Sounds like a wonderful time for relishing in Motherhood! looks like you all had a great week end!! Your family is darling BTW..
Ladies, we really enjoyed the weekend! It's unusual to have such cool weather in Alabama at this time of year, so I totally soaked it in. Beckie, I hope you had a wonderful Sunday! And Jen Sue Wild, WELCOME! Glad to have you. Megan, I had NOT, but I am looking them up now! What wonderful idea. Thanks so much!